There was a request for acupressure points for halitosis. But there is no acupressure point that makes halitosis go away like a magic on/off button. 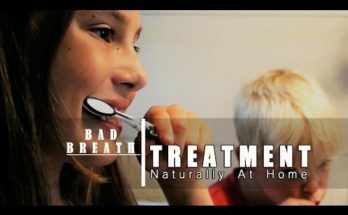 Halitosis is caused by something and you need to consider that something that’s causing halitosis. Bad breath can be caused by food stuck between your teeth or tooth decay. Or what’s left on your tongue. Or it can be coming from indigestion or poor stomach health. Another cause of halitosis is a dry mouth. Dry mouth can be caused by aging, stress,and certain medications. So, I’m going to show you the acupressure point and how you can massage to produce more saliva which helps to keep your mouth moist and clean. Saliva also helps to dissolve food and helps you swallow, and it’s anti-bacterial. Hopefully more saliva production will help with the halitosis you have but if it’s caused by dental or digestive issues, you need to go see a dentist or doctor. Let’s start with the acupressure point. The first one is called Conception Vessel23 or CV 23 and it’s one thumb width over the Adam’s Apple and at the slight depression at the upper border of hyoid bone. So here’s Adam’s Apple, hyoid bone, and slight depression. Press this point for 30 seconds as you breathe deeply. Since it’s by the throat don’t press too hard. Now the massage to produce more saliva. There are three salivary glands. Parotid glands by the ears, sub mandibular gland under the jaw bone, and sublingual gland under the tongue. Basically, you will massage over these glands. To activate the parotid glands, put your hands in front of the ears and gently circle 5 times. I have seen instructions to do the circle both forward and backward so I don’t think it matters which direction. But you will notice, just by putting your hands on your cheeks, it produces saliva. It’s a thin watery saliva that helps with digestion. Next, to activate the sub mandibular gland which is a U shaped gland under the jaw bone or mandible, gently press the soft part below the jaw bone with your thumbs upward. Do this on 3 or 4 locations between the ear and chin on both sides. Again, you will notice saliva production in your mouth. It’s a thicker saliva with a mixture of thin saliva for digestion and antibacterial thick saliva. Lastly, to activate the sublingual gland,put your thumbs together and gently press the tongue upwards 5 times. Press the area between the chin and throat. You will not feel much when you press up but when you let go you will feel your tongue was pressed against the roof of the mouth. When you press here, you will notice a thick antibacterial saliva production. Besides the acupressure and massage, oral hygiene is a must and also hydration is a must because saliva is 98% water. So drink lots of water. Previous Article What are Home Remedies for Acne and Pimples? Next Article What are the Different Types of Acne Ointment?